I am a huge fan of hand-dyed cloth diapers, blankets, and mama cloth. The swirls and creativity on each item are so appealing to my eyes! Plus, who can resist the softness of a hand dyed squishy fitted diaper? Sam, the founder of Ella Bella Bum says, " First and foremost, I’d like to thank you for your interest and for taking the time to learn more about Ella Bella Bum Cloth Diapers. With the help of so many wonderful supporters, Ella Bella Bum has experienced a steady growth over the past 3+ years and I’m so proud to tell you about the businesses humble beginnings and bright future!" Sam Campbell is the founder, owner, and creative designer of Ella Bella Bum Inc. Her husband is has been a strong driving force behind EBB from the very beginning, helping to create production space and helping out wherever he is needed. Together they have four beautiful children. In addition, the EBB team also includes 3 production assistants and 3 local WAHM seamstresses to help make their beautiful cloth diapers. One thing that I also love about Ella Bella Bum cloth diapers is that they have *FREE* North American Shipping on all items! 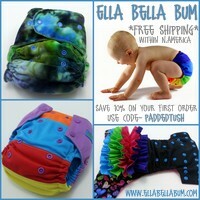 Plus, you can use the code "PADDEDTUSH" for 10% off your first order from Ella Bella Bum. And now for the giveaway! 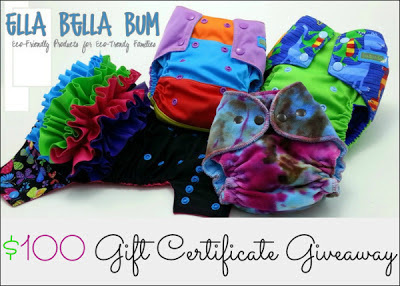 One lucky reader will receive a $100 Ella Bella Bum Gift Certificate! Giveaway ends June 20, 2013. Giveaway is open to US and Canada residents, ages 18+ only. Disclosure: I received no compensation for this publication. My opinions are my own and may differ from yours. 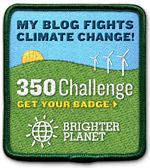 Why We Love Green and the other participating bloggers are not responsible for sponsor prize shipment or fulfillment. Please contact Christine or Teri with questions or to see your business or blog featured on the next big event!